What is Grade 30 Chain Used For? Grade 30 is the lightest-duty full-size chain that we sell. It is weaker than Grade 43 and Grade 70 chains, yet it still has its place in the rigging world. For general lashing, anchoring and pulling, it still works quite well. The main thing to consider is that it's not as elastic as higher grades of chain and it should not be used in critical applications. 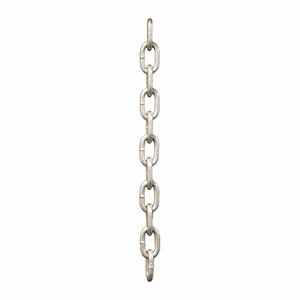 This chain is zinc-plated which makes it suitable for outdoor use, but is not ideal for use in marine environments (the finish is less durable than heavy galvanizing). It is also available in a plain self-colored finish.